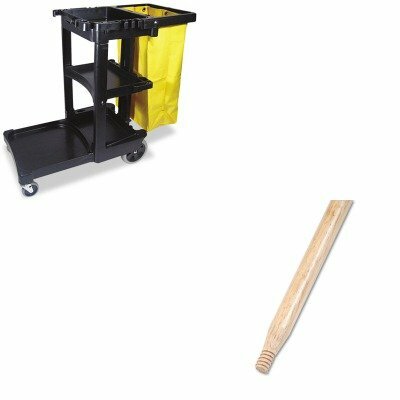 KITBWK137RCP617388BK - Value Kit - Boardwalk Heavy-Duty Threaded End Lacquered Hardwood Broom Handle (BWK137) and Rubbermaid Cleaning Cart with Zippered Yellow Vinyl Bag, Black (RCP617388BK) by Boardwalk at Blog Free Here. MPN: BWK137RCP617388BK. Hurry! Limited time offer. Offer valid only while supplies last. lt;stronggt;BWK137lt;/stronggt;lt;BR/gt;Boardwalk Heavy-Duty Threaded End Lacquered Hardwood Broom Handlelt;BR/gt;Natural lacquered hardwood. lt;stronggt;BWK137lt;/stronggt;lt;BR/gt;Boardwalk Heavy-Duty Threaded End Lacquered Hardwood Broom Handlelt;BR/gt;Natural lacquered hardwood. Standard thread. Handle Length: 60amp;quot; Handle Diameter: 1 1/8amp;quot;.lt;BR/gt;lt;BR/gt;lt;stronggt;RCP617388BKlt;/stronggt;lt;BR/gt;Boardwalk Heavy-Duty Threaded End Lacquered Hardwood Broom Handlelt;BR/gt;25-gallon vinyl bag attaches to handle. Three shelves for supplies hooks for mops and brooms. Platform holds standard size bucket supplies not incl.. Color: Black Caster/Glide/Wheel: Four Casters.